Geisha makeup is rooted in a long tradition of Japanese history and culture we can only begin to scratch the surface on. For us Westerners, we can learn more about the application and use of this genre of makeup, and discover that it is much more than just a Halloween costume. Geisha (the plural is the same as the singular) have long been confused with prostitution and other false facts that have plagued their profession, especially in recent years. 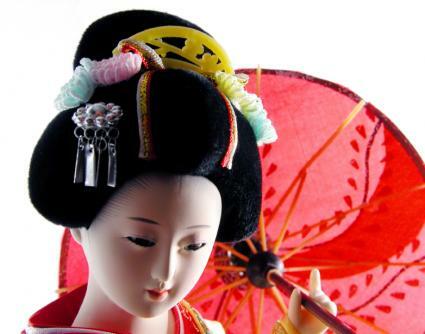 In actuality, geisha are Japanese females who entertain through music, dance, and the simple art of conversation. Often hired at tea parties or other events primarily for businesspeople, geisha are a popular part of Japanese culture gone past as well as still used today for tourism and novelty purposes. Hiring a geisha can be very expensive, and geisha are required to remain single. If one chooses to marry, she must retire from this unique and elegant profession that is rich in history and intrigue. Being a geisha is about much more than just applying the makeup. A young woman hoping to work full time as a geisha must go through rigorous training to learn everything from how to serve tea to how to dance in culturally correct manners. This process can take anywhere from 6 months to three years, depending upon the amount of time spent and the natural ability of the prospective geisha. Geisha go through a cycle of different phases and appearances, the two most obvious being the popularly depicted young geisha in heavy makeup, and the older more subtly made-up geisha that is closer to retirement age. The traditional geisha makeups most Westerners have seen in pictures and through other forms of media include the heavy white foundation base. This was originally made out of rice powder or with lead, the latter of which was most obviously not good for the geisha's skin! The traditional geisha makeup look also includes strikingly red lipstick and red & black decorative etchings around the eye area. Applying geisha makeup can be exhausting and has to be extremely precise due to the fact that one slip up with such a dramatic look can cause the geisha to look tacky, out of sorts, or unauthentic. Mastering the traditional geisha makeup look is exceptionally important as it is very expensive to hire a geisha and they must ensure that the customer receives what he/she has paid for. To get the look, a waxy formula called a bintsuke-abura is applied to the face. Then the famous white powder is mixed with water and formed into a paste. A few areas of the face and neck are usually left unpainted to give the look of a mask instead of natural skin. The eyes and eyebrows are filled in next, done with regular cosmetics. Traditionally charcoal was used, but now any geisha will happily settle for a tube of Revlon. Lipstick is then applied in shades of bright red and mixed with crystallized sugar in order to ad a lustrous look to the lips that would otherwise be very think. Some lips are only colored in partially, while others are colored fully. This determines what level of geisha the woman is. The higher up the food chain of geisha that you progress, the fuller and redder the lips. After a geisha has been employed as such for around three years or so, she will usually make her makeup less dramatic looking. This subdued style tells the world she is more mature now and she is allowed to show more of her own natural beauty. The Japanese value age a gift and benefit, as opposed to many western cultures which portray it as a downfall. The idea of the geisha has long been romanticized and made popular by Hollywood and stage productions. However, being a geisha in real life is a challenging and demanding profession that is more and more becoming a dying art. Geisha work very hard at their quality of art and tradition. They are to be respected and admired for what they have contributed to in the world of exotic makeup and continue to give to culture, tourism, and tradition.